A high-level look within our CreditRiskMonitor subscriber website shows that the restaurant industry is a highly fragmented, intensely competitive and economically sensitive one. Our FRISK® Stress Index suggests that restaurant financial risk is elevated in 2019. This is where CreditRiskMonitor's FRISK® score comes in. The proprietary score measures financial stress based on a “1” (most risky) to “10” (least risky) scale. 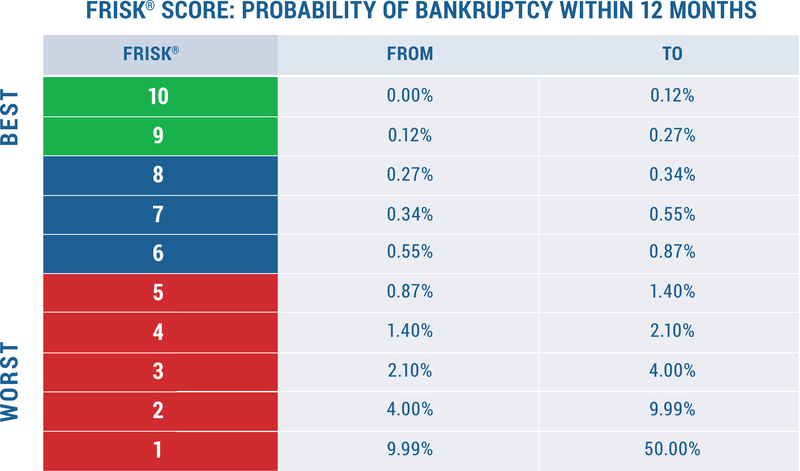 Any score equal to or less than a “5” is within what is called the “red zone,” indicating above-average risk of bankruptcy over the coming 12-month period. In concert, 96% of all U.S. public companies that eventually go bankrupt will show up in the red zone within one year of their filing. The score achieves this high degree of accuracy by using multiple data components, including market data, financial statement ratios, proprietary subscriber crowdsourcing and credit agency ratings, when available. And so, we see that roughly half of the public restaurant companies for which CreditRiskMonitor calculates FRISK® scores are in the red zone. Here we review three noteworthy restaurants that are exposing suppliers to material default and bankruptcy risk today. The FRISK® score, which is 96% accurate in predicting public company financial stress and bankruptcy risk. The FRISK® Stress Index, a free-to-use tool which measures the probability of failure across a group of companies in any industry, country, or customized portfolio. Restaurant upstarts with a popular concept seek to grow quickly by loading up their balance sheets with debt. The goal, it appears, is to capitalize on customer demand by quickly scaling up, then paying down accumulated debt later on. A common theme for mature concepts that are generating ample cash flow is to increase leverage in an attempt to boost shareholder returns. Yet customer tastes ebb and flow over time; when a once popular concept is out of step with current trends, financial results weaken. The leverage that once amplified returns can then become a material financial headwind. A strong economy can help to hide – or at least soften – the impact of such issues. Good times don't last forever, unfortunately. When the economic tides turn, restaurant traffic usually pulls back, which adds additional stress to already struggling companies. The current economic expansion, for example, has now extended beyond the point where most expansions have turned for the worse. Granite City operates two casual dining concepts, Granite City Food & Brewery (32 locations) and Cadillac Ranch All American Bar & Grill (four locations). It also operates a centralized beer production facility in Iowa that facilitates the initial stages of the brewing process which is then completed in the company's restaurants. Granite City has been stuck in the red zone for nearly a year, languishing for months with a poor FRISK® score of “2,” indicating extreme financial stress and elevated bankruptcy risk. Revenues have been stagnant for a year and the company has posted negative free cash flow in four of the last five quarters. It also had negative free cash flow in four of the last five years through 2017 as well. The bigger problem is that the total debt-to-assets ratio has been creeping steadily higher over the last five years and was over 100% in the third quarter of 2018. A heavy debt load and an ongoing cash burn is a very troubling combination. Granite City has been in default on a key credit facility since late December 2016. That default also triggered a default on subordinated debt, since the credit facility covenants require that it be paid before the subordinated debt. The restaurant has been paying the interest on the credit facility on and off since that point, but has yet to find alternative sources of financing or improve results enough to alleviate the default. The prospects aren't great at this point, with weak same-store sales leading to restaurant closures. The Kona Grill, Inc. FRISK® score is anything but appetizing. The restaurant posted negative free cash flow in three of the last five quarters and every year between 2013 and 2017. Net income was negative in each of the last five quarters and each year between 2015 and 2017, as well. Accordingly, stockholders equity and tangible net worth have fallen dramatically over the last year. The company has slowed its growth rate, pulling back on opening new stores in 2018. According to the third quarter 2018 10-Q, that reduced Kona Grill's capital spending from $11.2 million through the first nine months of 2017 to just $1.4 million in the same period of 2018. According to a company statement: "We are focused on building sales, improving margins and generating cash flow to repay debt." Cutting back on new store openings should help Kona Grill achieve these goals, yet interest expenses remain a sizeable burden. In early 2018, Kona Grill sold new shares to a private investor and to Chairman of the Board, Berke Bakay, in an attempt to raise capital. That helped to shore up the company's finances, with a portion of the proceeds used to pay down a revolving credit line. On the other hand, that credit line was amended in 2018, increasing protective covenants, decreasing availability and increasing the borrowing rate; none of which will ease the turnaround effort. The company has also been quick to re-arrange leadership roles, including Bakay’s successor as CEO, Jim Kuhn, in August of 2018. Although Kona Grill could survive this trouble spot, there is still uncertainty. If you work with Kona Grill, the FRISK® score is flashing an important warning sign that you need to pay extra attention to the company's finances today. Luby's is managed through three segments: company-owned restaurants (142 locations under various Luby's nameplates), franchise operations (104 Fuddruckers restaurants) and Culinary Contract Services (offered at 30 locations, including healthcare, educational and corporate sites). The FRISK® score declined through most of 2018 and now sits at a troubling "2." The Luby's Inc. FRISK® score dropped to a "2" heading into 2019, it's lowest score in 18 months. Net income was negative in each of the last five fiscal years and in five of the last five quarters. Free cash flow was negative over each of those time periods, as well. All of the company's debt was re-classified as short term in June of 2018, following an amendment to its credit facility that shortened the expiration to less than a year. The amendments put in place additional protective covenants for the lender, notably requiring debt repayment from asset sales. The company has been working to implement these sales to raise cash in the amount of $25 million, but subsequently increased their target to $45 million (assuming all sales are realized). Management highlighted the need for debt reduction as the core reason for the increased target. The company received a lifeline in late 2018, when it was able to find a new lender. However, the new agreement comes with an onerous rate (LIBOR plus 7.5%) and has strict repayment terms starting in December of 2019. Luby's bought itself time, yet its financial problems are not nearly close to being solved. Thus, if you are selling to Luby's, the FRISK® score is yet again flashing an important warning sign. You may need to think about protection from slow payment or financial loss. Granite City Food & Brewery Ltd., Kona Grill, Inc. and Luby's, Inc. are just three examples of financially troubled restaurants; a look at the FRISK® Stress Index shows that there are more than 30 large-scale public companies within the industry to actively follow with red zone FRISK® scores. If consumer sentiment or the economy weakens, more and more restaurants could be put under pressure. CreditRiskMonitor's proprietary FRISK® score covers this entire industry carefully and with high accuracy. If your company sells into the restaurant industry, give us a call today and we'll help you figure out which of your counterparties should be on your credit watch list right now.